What is a course link? It's your direct entryway to your course. You'll get it from your instructor. Use it to register an access code, buy access or get temporary access. 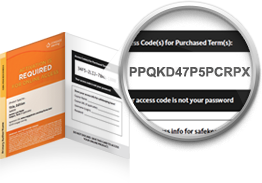 An access code lets you register online materials that may come packaged with some new Cengage textbooks, purchased on a printed card at local bookstores, or purchased online. Please follow the instructions provided with your access code to register your product. A course key is a string of numbers and letters that identifies the specific materials you will need access to for your course. Your instructor should provide this key to you. Course keys for most Cengage products can be registered here. Those products have course keys which are a 12 or 15-digit string of numbers and letters. There are a few specific types of course keys that cannot be registered here. To register a WebAssign class key, go here. For CourseMate, Write Experience and others, first activate your product access code. Then login to CengageBrain, open the product and enter the course key directly into the product. Enter a valid Course Link, Access Code or Course Key. How do I find my Course Link, Access Code, or Course Key? My Access Code has already been used, what happened? Did you purchase a used book? If your access code came with a used book, the access code may have been used before. Access codes are single use. Return to where you purchased this product for assistance. Did you register using a different account? You may have already registered this product using a different CengageBrain.com account. If so, try logging in using your alternative account.